I've read in numerous sources that the output of PHP's rand() is predictable as its a PRNG, and I mostly accept that as fact simply because I've seen it in so many places. I'm interested in a proof-of-concept: how would I go about predicting the output of rand()? From reading this article I understand that the random number is a number returned from a list starting at a pointer (the seed) -- but I can't imagine how this is predictable. Could someone reasonably figure out what random # was generated via rand() at a given moment in time within a few thousand guesses? or even 10,000 guesses? How? This is coming up because I saw a auth library which uses rand() to produce a token for users who have lost passwords, and I assumed this was a potential security hole. I've since replaced the method with hashing a mixture of openssl_random_pseudo_bytes(), the orignal hashed password, and microtime. After doing this I realized that if I were on the outside looking in, I'd have no idea how to guess the token even knowing it was a md5 of rand(). This isn't just some fluke. Most PHP versions* on most platforms** will generate the sequence 97, 97, 39, 77, 93 when srand'd with 1024. To be clear, this isn't a problem with PHP, this is a problem with the implementation of rand itself. The same problem appears in other languages that use the same (or a similar) implementation, including Perl. So, it's some math with time(), the PID, and the result of php_combined_lcg, which is defined in ext/standard/lcg.c. I'm not going to c&p here, as, well, my eyes glazed over and I decided to stop hunting. Not only does this function (gettimeofday) hand us back a precise server timestamp on a silver platter, it also adds in LCG output if we request "more entropy" (from PHP's uniqid). Yeah that uniqid. It seems that the value of php_combined_lcg is what we see when we look at the resulting hex digits after calling uniqid with the second argument set to a true value. Just replace that last step as required. On the other hand, if the code you're trying to product calls srand manually, then unless they're using something many times better than the result of php_combined_lcg, you're probably going to have a much easier time guessing the value and seeding your local generator with the right number. Most people that would manually call srand also wouldn't realize how horrible of an idea this is, and thus aren't likely to use better values. It's worth noting that mt_rand is also afflicted by the same problem. Seeding mt_srand with a known value will also produce predictable results. Basing your entropy off of openssl_random_pseudo_bytes is probably a safer bet. tl;dr: For best results, don't seed the PHP random number generator, and for goodness' sake, don't expose uniqid to users. 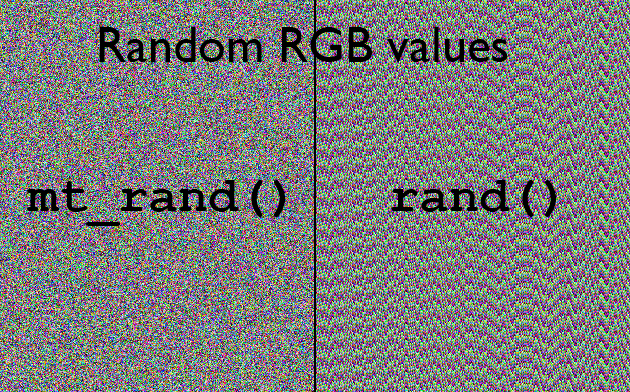 Doing either or both of these may cause your random numbers to be more guessable. PHP 7.0 introduces random_bytes and random_int as core functions. They use the underlying system's CSPRNG implementation, making them free from the problems that a seeded random number generator has. They're effectively similar to openssl_random_pseudo_bytes, only without needing an extension to be installed. A polyfill is available for PHP5. *: The Suhosin security patch changes the behavior of rand and mt_rand such that they always re-seed with every call. Suhosin is provided by a third party. Some Linux distributions include it in their official PHP packages by default, while others make it an option, and others ignore it entirely. **: Depending on the platform and the underlying library calls being used, different sequences will be generated than documented here, but the results should still be repeatable unless the Suhosin patch is used. There normally shouldn't be any pattern in the images. I've tried calling srand() with different values, it doesn't change how predictable this function is. Note that both aren't cryptographically secure and produce predictable results. It is a linear congruence generator. That means you have a function that is effectively: NEW_NUMBER = (A * OLD_NUMBER + B) MOD C. If you chart NEW_NUMBER vs OLD_NUMBER you will start to see diagonal lines. Some of the notes on PHP's RAND documentation give examples of how to do so. This is coming up because I saw a auth library which uses rand() to produce a token for users who have lost passwords, and I assumed this was a potential security hole. On a windows machine, the max value of RAND is 2^15. This gives the attacker only 32,768 possibilities to check. While this article isn't exactly the one you are looking for, it shows how some researchers took an existing implementation of a random number generator and used it to make money on Texas Holdem. There are 52! possible shuffled decks, but the implementation used a 32-bit random number generator (which is the max number out of mt_getrandmax on a windows machine), and seeded it with the time in milliseconds since midnight. This reduced the number of possible shuffled decks from about 2^226 to about 2^27 making it possible to search in real time and know what deck has been dealt. After doing this I realized that if I were on the outside looking in, I'd have no idea how to guess the token even knowing it was a md5 of rand(). I'd recommend using something in the SHA-2 family as the feds consider md5 broken. Some folks use google to decrypt md5 hashes because they are so common. Just hash something then throw the hash into a google search - basically google has become a giant rainbow table. It is really more accurate to say that given a randomly generated number, the next one is relatively predictable. There are only so many numbers it can be. But that doesn't mean that you could guess it, more that you could write a program that does, pretty quickly. Not the answer you're looking for? Browse other questions tagged security random or ask your own question.